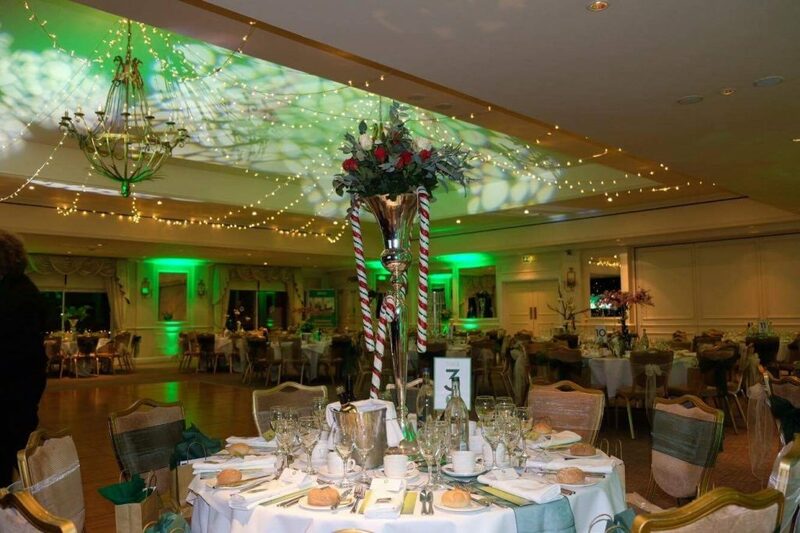 The Colchester NSPCC Business Group’s final Emerald Ball celebrated its 10th year anniversary at a spectacular evening at Stoke-by-Nayland Hotel and Spa on Saturday. The group took an incredible £10,000 as it retires its annual flagship event in a sparkling showcase looking back at their achievements and memorable moments. All the money raised will go towards supporting invaluable NSPCC projects throughout Colchester and Essex to ensure vulnerable children are helped as and when they need it. Glamorous guests kindly emptied their pockets as auctions, raffles and games took place during the evening of fundraising. They were treated to performances from Laura Rampton School of Dance, stilt-walkers and The Company Performing Arts; as well as musical treats from Blue Juice and the fantastic Daisy Jackaman during and after a 3-couse meal. Angie Scott Cakes also created an extreme cake to top off the evening, which displayed moving images from throughout the Group’s ten years of fundraising. Money raised at the Emerald Ball bought over the years has been put to important use supporting those who need it most, such as the Essex Young Witness Scheme, enabling the ‘Stay Safe, Speak Out’ program in schools to help children understand when they are in danger and supporting the invaluable work carried out in the region by the Childline service. The group now forms the blueprint for other local NSPCC franchises wanting to replicate the Group’s success in their region. Katie Skingle, Chair of the NSPCC Colchester Business Group, said: “It was an emotional evening from start to finish and I truly can’t thank everyone enough for their amazing support on the night and over the last ten years. Seeing some of the faces that have been with us over the last decade and the founding members there really was special. Next year, the Colchester NSPCC Business Group and KAT Marketing will be turning its focus to a series of new summer events to continue with its fundraising efforts. To join the Colchester NSPCC Business Group (CNBG) please visit our Join page. The 9th NSPCC Emerald Ball landed on Saturday night raising much-needed money for vulnerable children in Colchester and surrounding areas. 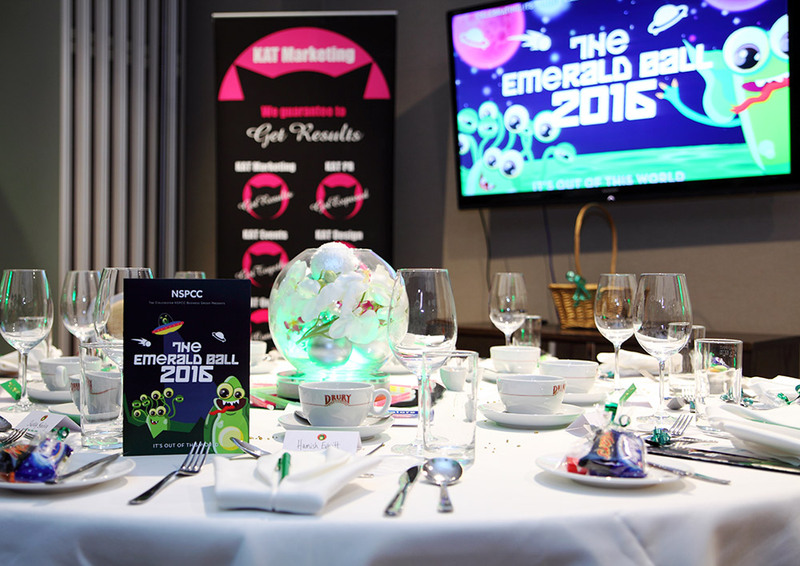 KAT Marketing and Colchester NSPCC Business Group’s ‘Out of This World’ dinner dance beamed down for a night of space-themed glamour held at Wivenhoe House Hotel. The star-spangled and fun-packed evening featured Stormtroopers, cartoonists and 5 piece band ‘The Fandangos’ and guests even enjoyed an impromptu ‘Mannequin Challenge’ which was recorded for social media. The NSPCC is celebrating 30 years of Childline in 2016 and the evening helped the local group boosts its donation to just over £5,000 in support of this service. The annual event promotes the NSPCC, their ChildLine service – which is celebrating its thirtieth year – and all the amazing work they do for local children. The money generated will be used to ensure that children aged 5-11 will learn the invaluable and essential safeguarding information. The NSPCC’s ‘Speak Out. Stay Safe’ programme provides local children in the Essex area with child-friendly and interactive workshops aimed to help them understand and recognise the varying types of abuse and raise the alarm if they arise. Katie Skingle, Chairwoman of the NSPCC Business Group, was delighted to bring a “galaxy far away to Colchester for one night only” saying: “The theme really bough this marvellous event to life for its 9th year and all for a cause that is close to our hearts and something we are immensely proud to support. To join the Colchester NSPCC Business Group (CNBG) please go to www.colchesternspccbusinessgroup.org.uk and register your interest.